It's about time, teachers, ... for some creative expression on Sneaker Day. Following are some ideas for art projects. Ask your students to make crayon rubbings of the soles of their sneakers. Newsprint works much better than construction paper. 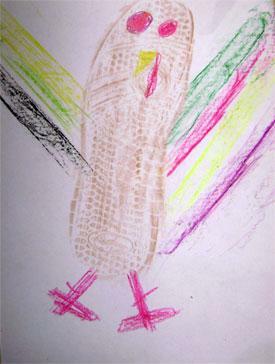 If you have left over crayons from last year, give those to your students to make the rubbings. They may be hesitant to peel the paper off their brand new box of crayons! For best results, students should rub in only 1 direction. "Scrubbing" back and forth often causes the paper to rip. For young children, taping the paper to the shoe is often helpful. After all the students have completed their rubbings, you can use the rubbings to talk about patterns, shapes, texture, design, ... The rubbings could also be used for categorizing according to such things as shapes in the sole or added elements (brand name, logo, or designs). For more fun, allow the students to swap shoes and make additional rubbings on the same piece of paper. Encourage them to use multiple colors. Let them decide when they have enough soles to make their picture complete. Another idea is to use a single rubbing and add details to it to make a picture. 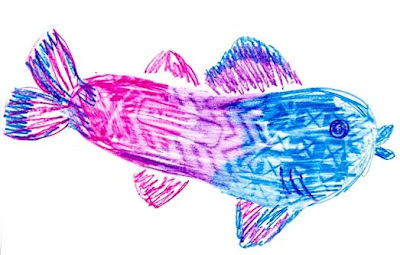 Notice that the fish artist used multiple colors to make the initial rubbing. Your class can make awesome, abstract paintings with shoelaces. Collect several old shoelaces (even frayed and broken ones). Have the children dip one in tempera paint and then lay the shoelace on a piece of construction paper. As the picture shows, you can use multiple colors of paint -- each color with its own shoelace. Just be forewarned that unless you have extremely patient students who are willing to wait until the first color dries, you will eventually have shoelaces that are sporting multiple colors; not necessarily in a pleasing way. To reduce the messy factor somewhat, tie one end of the shoelace to an old pencil that will span the width of the paint container. 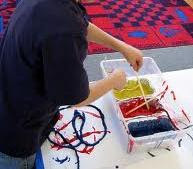 Then students can lift the shoelace out of the paint without immersing their fingers. There are many variations of this project. Make it a printing project by placing another sheet of paper on top of the shoelace that was placed on the paper as above. By gently pressing down on the top paper, you will produce a negative print of the bottom paper. My preferred method for doing this is to simply fold a 9" x 12" piece of construction paper in half first. Then put the paint soaked shoelace on one half; fold the other half over the top of the shoelace. Unfold and you will have a lovely, symmetric print. Start with the folded construction paper as described above. Again put the shoelace on just one half of the paper, leaving an inch or so hanging out. Fold the paper over the top of the shoelace. Then, applying pressure to the paper with one hand, pull the string out slowly. This will create a lovely smeared effect. I especially like to do this project with white paint on black paper or black paint on white paper. The display is really striking.